MTEKF is actually pretty tough. Slaughter aficionados may hem and haw, but the average player will have some (well, plenty of) difficulty making it through on UV. It's a mixture of pitched battles combined with teleportation traps. The opening pistol start isn't that bad – you're just ringed by imp fireballs – but you've got to figure out where to go. The crumbling wall gives you a clue, but it'll be a little while before you've got a rocket launcher comfortably holstered and ready to take a breath, more so if you blindly rush into the base. Some of the earliest difficulty leaps include an unwelcome pack of pain elementals (a definite heart-stopper!) 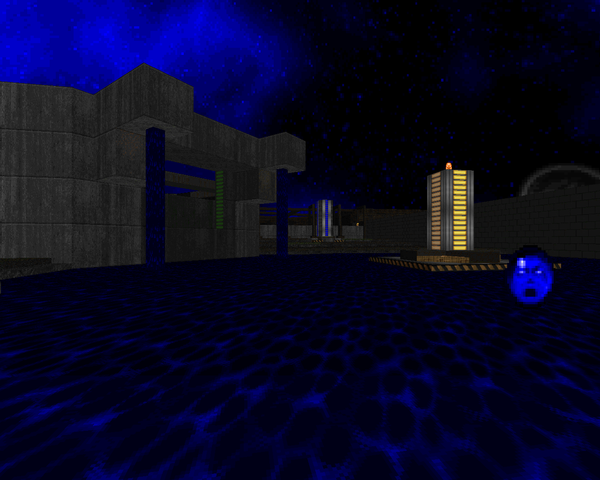 and perhaps that huge wave of imps in the blue keycard area. Things kind of wind down afterward. The Cyberdemon bridge may be a shocker, but it's simple to escape, and the surrounding battles aren't much to worry about. The real showstopper is the finale, a timed battle in several stages. You can tease the monsters on the edge out, but if you lack the nerves of steel required to bump Cyberdemons with the BFG, be afraid. You get one plus a pack of imps, another a little while later, followed up with a pack of arch-viles in the exit room. I'm not sure when the north and south walls fall apart, revealing some invading revenants, but you'll have to watch out for that, too. It's rollicking good fun, especially if you get any remaining Cybers to shell the sorcerers, which gives you some time to reach a safe area. Midnight Tek Frenzy looks gorgeous. It's part of the reason I feel the comparison to Vanguard is so apt. The outer areas are certainly serviceable, with some great lighting and simple architecture, but the central base is a feast for the eyes. 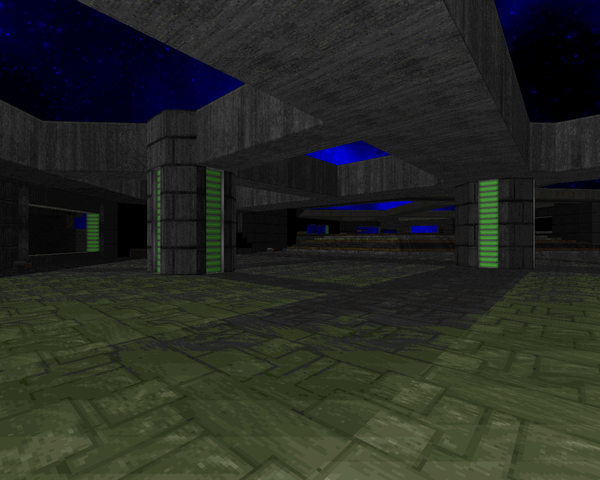 It's all very clean with some nice ceiling work (and even some OSHA-friendly staircases!). 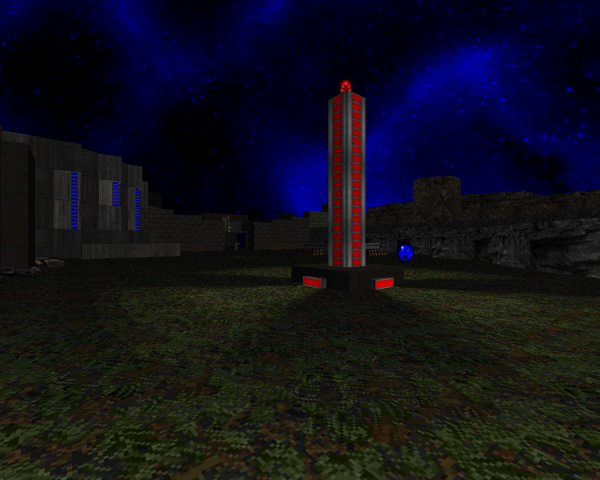 Basically, the map layout and texture use complement each other quite nicely. Regardless of the author's assertions, it looks well-groomed to an eye unaccustomed to WAD authorship. That stunning night sky just crystallizes everything into place for a phenomenal experience. 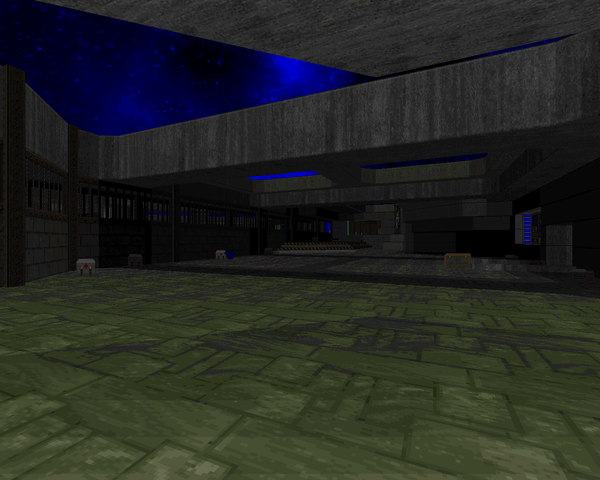 If you're looking for a nice, modern Doom II map that offers some challenge, you should feel right at home with Midnight Tek Frenzy. The more open style may turn off some players that prefer more ritual room clearing, but I thought it was a very fun, very fast play, worthy of "Where Izit". And, maybe it's just me, but I can't get enough of the wonderful Community Chest 4 texture pack. 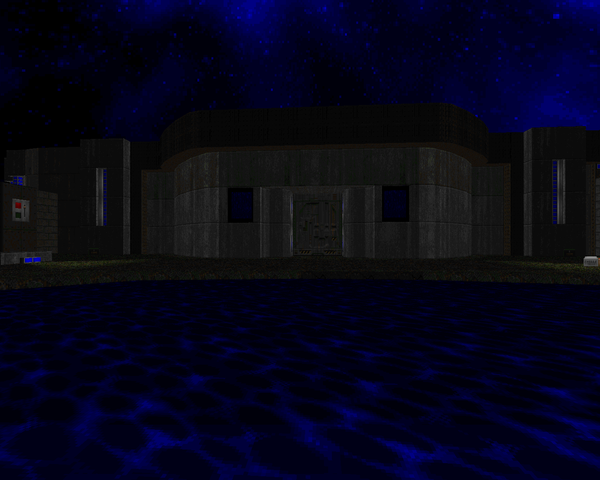 Some might think it's overexposed, but I'll take just about anything instead of stock Doom II nowadays. So, download MTEKF and have a blast. Hopefully we'll be seeing more super-cool CC4 stragglers in the future (and, uh, CC4). DO YOU KNOW WHERE YOUR ROCKET LAUNCHER IS? Oh wow... this is a great surprise! I'm glad you enjoyed playing it so much. I can only hope the community enjoys it and UR as much (and UR is like this map, but a good 30 times or so O_O). P.S. - Whenever you link people to my /idgames wads, it's best to link them to a search for "Brian Knox" as that's how I plan on authoring my wads from here on out. Definitely looking forward to Unholy Realms and CC4! The following reviews have been completed in an entirely different style at great expense and at the last minute.